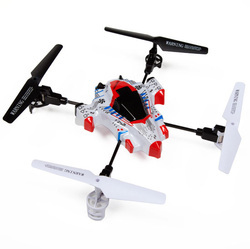 Blast off with the DMZ F1 Cruiser 4.5CH 2.4GHz RC Quadcopter! With four main rotors, this quadcopter is incredibly stable in the air. The 4 channel radio control lets you move forward, backward, up, down, as well as rotate and lateral movement. The built in gyro gives you amazing agility while remaining extremely stable. There is also a 360 degree Flip Stunt Mode which lets you easily pull off loops by moving the right stick on the transmitter. 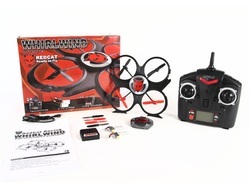 The 2.4GHz radio technology allows you to control this quadcopter at an incredible range with no radio interference. The transmitter even has a LED screen. All you need are 4 AA batteries and you're good to go! Get ready to explore the great unknown with the DMZ F1 Cruiser 4.5CH 2.4GHz RC Quadcopter!